The Cubs came back strong from their shocking loss in the 1906 World Series. The Tigers' young star Ty Cobb came into the Series with the first of his many league batting championships. With pitching dominance over the Tigers and Cobb, the Cubs allowed only three runs in the four games they won, while stealing 18 bases off the rattled Tigers. Tigers pitcher "Wild Bill" Donovan struck out twelve Cubs in Game 1. Although that matched Ed Walsh's total in Game 3 against the Cubs in 1906, it was across twelve innings. Donovan struck out just ten Cubs in the first nine innings of the game. Chicago Cubs vs. Detroit Tigers, Bennett Park, Oct 12, 1907. The Tigers scored three runs, largely due to three Cub errors, in the eighth inning and held a 3–1 lead going into the bottom of the ninth. The Cubs loaded the bases on a single, walk and infield error with one out. Detroit conceded a run on a ground ball for the second out, and Cub player-manager Frank Chance then punch-hit Del Howard for Joe Tinker. Wild Bill Donovan (25–4 in the regular season) struck him out, but the ball got away from catcher Boss Schmidt, allowing Harry Steinfeldt to score the tying run. Donovan got the next hitter, but the damage had been done. The teams then played three scoreless extra innings before the game was called on account of darkness and declared a tie, a World Series first. This was the closest the Tigers would come to winning a game in this, their first Series. The Cubs committed five errors and struck out twelve times in the game, but nine stolen base attempts (seven successful) and five bunts (two for hits) set an aggressive offensive tone that would presure the Tigers for the rest of the series. George Mullin, who both won and lost 20 games for Detroit in the regular season, and who had walked over 100 batters in each of his last five seasons, issued a bases-loaded walk in the bottom of the second, matching the Tiger run in the top of the inning and tying the score at 1–1. Chicago scored two more in the fourth on a single, sacrifice bunt, RBI single, stolen base and double to take a 3–1 lead. Jack Pfiester, while allowing ten hits, benefited from two double plays and three caught-stealings by battery-mate Johnny Kling and was the winning pitcher for the Cubs. Joe Tinker scored a run and drove in another in Game 2 after being pinch-hit for in the ninth inning of Game 1. Cub pitcher Ed Reulbach scattered six hits as Chicago jumped on Tiger starter Ed Siever for four runs on seven hits in only four innings en route to their second win. Johnny Evers had three hits, including two doubles, as the Cubs took a 2–0 lead in the Series. In their first World Series home game, the Tigers took a 1–0 lead on a triple by their 20-year-old batting champion Ty Cobb and an RBI single by Claude Rossman in the bottom of the fourth, shortly before a rain delay in the top of the fifth. Soon after play resumed in the same inning, two Cubs reached base on an error and a walk. After Joe Tinker sacrificed, pitcher Orval Overall drove both runners home on a single to right. The Cubs scored three more in the seventh without the ball leaving the infield, on four bunts (two for hits) and two ground balls. Regular-season 23-game winner Overall was masterful after the rain delay, allowing only one hit in Detroit's final five innings, giving his Cubs a commanding 3–0 lead in the Series. Chicago wrapped up the series with a 2–0 victory on "Three-fingered" Mordecai Brown's seven-hit shutout. The Cubs scored a run in the top of the first on a walk, stolen base and RBI single by Harry Steinfeldt and scored again in the second on an error, a single, a double-steal and a groundout to drive in the last run of the Series. Detroit had runners on second and third with one out in the last of the fourth, but left them there and never seriously threatened after that. This Series would be the closest to a four-game sweep until the first true Series sweep in 1914, when George Stallings' "miracle" Boston Braves surged from last place in mid-July to win the NL pennant and upset Connie Mack's haughty Philadelphia Athletics in the Series. ↑ "1907 World Series Game 1 – Detroit Tigers vs. Chicago Cubs". Retrosheet. Retrieved September 13, 2009. 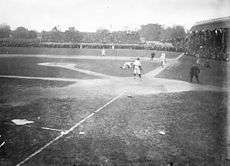 ↑ "1907 World Series Game 2 – Detroit Tigers vs. Chicago Cubs". Retrosheet. Retrieved September 13, 2009. ↑ "1907 World Series Game 3 – Detroit Tigers vs. Chicago Cubs". Retrosheet. Retrieved September 13, 2009. 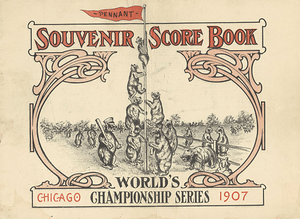 ↑ "1907 World Series Game 4 – Chicago Cubs vs. Detroit Tigers". Retrosheet. Retrieved September 13, 2009. ↑ "1907 World Series Game 5 – Chicago Cubs vs. Detroit Tigers". Retrosheet. Retrieved September 13, 2009. Cohen, Richard M.; Neft, David S. (1990). The World Series: Complete Play-By-Play of Every Game, 1903–1989. New York: St. Martin's Press. pp. 18–22. ISBN 0-312-03960-3. Reichler, Joseph (1982). The Baseball Encyclopedia (5th ed.). Macmillan Publishing. p. 2115. ISBN 0-02-579010-2. History of the World Series - 1907 at The SportingNews. Archived from the original on 2008.